IKEA surprisingly acted like a British gentleman following news that soccer lovers had turned one of its stores upside-down as a result of England’s win to Sweden at the World Cup. After the English beat Sweden 2-0, a throng of fans headed down to a store in Stratford and were filmed jumping on its beds and creating a ruckus. The Swedish furniture brand, however, handled the drama with class. 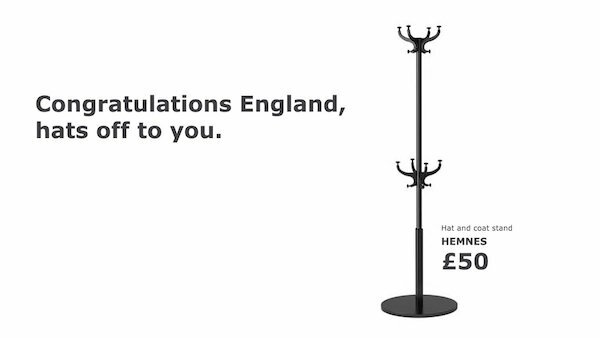 First, it posted a congratulatory tweet that doubled as an ad for its hat and coat stand. “Congratulations England, hats off to you,” it said. When customers wrote in about the incident, it cooly responded that it was aware of a “small group” of people “celebrating” the win in one of its locations. Not only was the company being awfully polite, it also priced its fish and chips—a quintessentially English dish—at only £1 (US$1.33) to mark the milestone. The quarterfinals might be over, but it looks like IKEA has just walked away with the overall champion’s medal.